How much do you know about pandas? Take our quiz and find out! 2) Pandas can eat up to 40 pounds of bamboo a day. 3) Pandas are not really bears; they are in the raccoon family. 4) There are only about 1,000 pandas living in the wild today. 5) In the cold, wet Chinese winters, pandas hibernate. 6) Mother pandas and their babies go separate ways when the baby gets to be about 3 years old. 7) Pandas rely heavily on their sense of smell to communicate, using scent glands to leave marks in their territory. 8) China no longer gives pandas to other nations; rather, they loan the animals for a certain number of years. 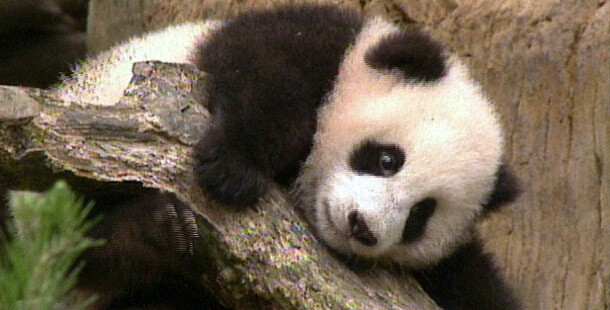 9) Pandas often give birth to twins, and can successfully raise both. 10) To identify individual wild pandas, all researchers need is DNA extracted from a few strands of fur snagged on a wire.